Dear 'Best Dad Ever', I hope that you have a wonderful birthday today. 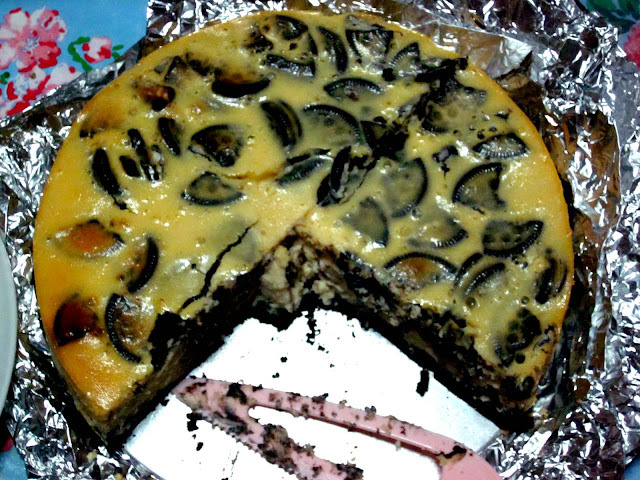 And i hope that you like the Chocolate Chip Cheesecake that i'd baked for you as your birthday cake. Never mind that you have another two birthday cakes sitting in the fridge. That's one of the advantages of having a pastry chef as a friend. Maybe i should find myself one too and get him/her to stuff all kinds off confections in my fridge. Yep. I still remember my first experience with cheesecake. Two words: Bloody Disaster. Literally. I accidentally cut my fingers really deep when trying to cut the lime into two with a semi-blunt knife. Totally epic fail. 3) To let it cool down slowly in the oven for an hour or more. ARGHH!! Run for your life! Undeniably the ugliest cheesecake in history. But i've been practicing, and as you can see, i'm improving a little :D.
This Chocolate-Chip Cheesecake is perfect for those who love the combination taste of cheese and chocolate. It's creamy, tangy and chocolatey. A very delightful dessert indeed! I would be happy to eat this for breakfast, lunch, dinner and supper for like... a week. And get myself really sick. I chose Chipsmore chocolate-chip cookies as the bottom crust of the cheesecake. This cookie brand has been my favourite ever since i was little! You can choose your own favourite brand for the crust. The one thing that i need improving is the leveling of the crust. Some areas have higher crust then the others. Any tips to share? One very useful tip that i've learnt from a food blogger: Beat the cream cheese with a mixer until it's creamy/soft only (DO NOT over beat the cream cheese). Then beat the rest of the ingredients using only a wooden spoon to avoid overbeating. Follow this tip and you won't regret it. Promise. I'd folded in the chocolate chips into the batter but in the end they sank to the bottom and became part of the bottom crust. Which is not really a bad thing actually. In the end it did have a small crack but i'd covered it up by drizzling hershey chocolate syrup all over! And TADAA! Fill an oven safe cake pan (I use a 9×9) 3/4 full with warm water. Set on bottom oven rack while oven is preheating. In a medium mixing bowl, combine cookie crumbs and butter, stir to combine. Press onto bottom and 1 inch up side of prepared pan. Bake in preheated oven for 10 minutes. Remove and increase oven temperature to 350. In a large mixing bowl beat cream cheese until creamy. Add sweetened condensed milk and beat until smooth. Add sugar and flour, beat to combine. Add eggs one at a time beating only to combine after each addition. When adding the third egg, also add the lime juice and vanilla extract; beat until combined. Using a spatula, gently fold in the chocolate chips. Gently pour batter evenly into prebaked crust. Then sprinkle as many chocolate chips as you desire at the top of the batter. Bake in preheated oven for 50-65 minutes or until edge is set and center moves slightly. Watch carefully and do not overbake. Drizzle chocolate syrup all over if desired. That looks absolutely delicious. I'm such a sucker for cheesecake and adding chocolate to the mix can only mean something AMAZING! This look heavenly, look so delicious! I gonna to list you in my blog list. Thanks for listing me in your list! Am a fan of your blog! Exquisite looking cheese cake. Dessert I'll be proud to serve! Your design really came out elegantly. A sure favorite, I must say! Thanks for sharing! Cheers! Practise makes perfect kaka! I have yet brush up my skills on the marshmallow flower-like cupcake we did on danish's birthday back then. CAPITAL L.O.L. hahaha i miss that! Good job Kaka Nana! Haha! Guess what? I've finally found the pics of the marshmallow flower cupcakes that we made! Epic fail seh! hahakz! Chips More! Awesome looking cake, especially with dat crust! !